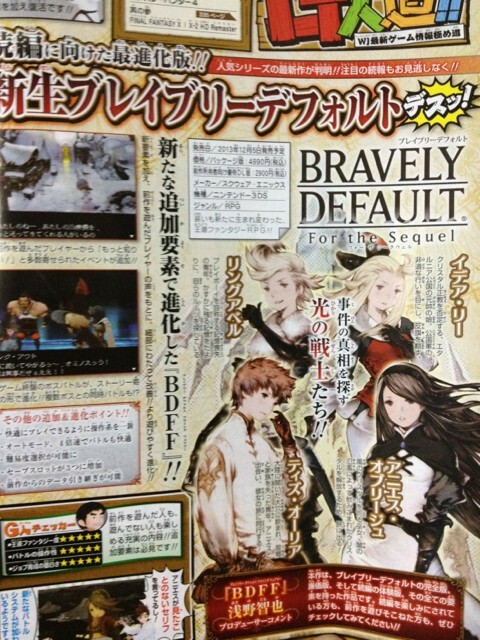 Leaked in Jump Magazine, Bravely Default: For the Sequel has been announced. This is an expansion of the original game featuring new story events, refined controls, an “auto-mode” that makes battles up to four times faster, difficulty options and a few more save-slots to use in-game. It will release in Japan on December 5th, 2013 for 4900yen, and a digital expansion to the original game is offered for 2900yen. More than one individual is speculating that this could be the version arriving in the West in 2014. It would certainly explain why the game is taking so long to arrive overseas/the mysterious delay in Europe. Not much information is known about this re-release/expansion, because this is concerning a leak, but I’m sure a lot more Bravely Default news is coming. We’ll be sure to keep you updated as we learn more about the game. What do you all think? Is this the version the West will be playing next year? Will we have a shot at playing the sequel as it’s developed? Are you super-excited? (Of course you are!) Tell us your thoughts. More as we hear it!